On September 28th and 29th, Alpaca breeders from across the U.S. and Canada will invite the public to come to their farm to meet their alpacas and learn more about these inquisitive, unique animals, the luxury fiber they produce, and why the alpaca business is perfect for environmentally conscious individuals! From 1pm-5pm, each day, Maple Hill Manor will welcome guests and their families to join them for many activities including Farm Tours, Alpaca Pen Sales, and Farm Store Specials – and attendance is FREE! Maple Hill Manor is located at 2941 Perryville Rd./U.S. 150, just 2 miles east of Main Street Springfield, Kentucky. Alpacas, cousins to the llama, are beautiful, intelligent animals native to the Andean Mountain range of South America, particularly Peru, Bolivia, and Chile. The United States first commercially imported alpacas in 1984. There are now over 160,000 ARI (Alpaca Registry, Inc.) registered alpacas in North America. There are two types of alpacas in the United States today. Although almost physically identical, what distinguishes the two types of alpacas is their fiber. The Huacaya (wa-Ki’-ah) is the more common of the two and has a fluffy, extremely fine coat. The Suri (SUR-ee) is the rarer of the two and has fiber that is silky and resembles pencil-locks. Alpacas are shorn, without harm, every twelve to eighteen months. They produced five to ten pounds of luxurious fiber. Long ago, alpaca fiber was reserved for royalty. Today it is purchased in its raw fleece form by hand-spinners and fiber artists. Knitters buy it as yarn. Alpacas come in 22 natural colors, but they are all green! Alpacas prefer to eat tender grasses, which they do not pull up by the roots. Lacking upper teeth, alpacas “cut” the grass with their bottom teeth and upper palate. This vegetation cutting encourages the plants’ growth. Because they are modified ruminants with a three-compartment stomach, alpacas convert grass and hay to energy very efficiently, and stop eating when they are full, further preserving the landscape on which they live. However, alpacas do not mind eating brush, fallen leaves and other “undesirable” vegetation, leaving the “good stuff” for species that do not have the stomach to digest such roughage. Alpacas’ pellet-like droppings are PH balanced, and an excellent, natural, slow release, low odor fertilizer. This rich fertilizer is perfect for growing fruits and vegetables. Because alpacas consolidate their feces in one or two communal spots in the pasture, it is easy to collect and compost, and the spread of parasites is controlled. While alpacas are environmentally friendly … and even beneficial… to the land, what makes them even more “green” is the fiber they produce. No chemicals are employed either during feeding or during the industrial production of alpaca fleece into fiber. If dying is desired, only 20% of a normal dye quantity is required. All fiber from an alpaca can be used. Even the fiber from the lower legs, belly, neck, etc is being used for things such as natural weed mats to be placed around trees. Alpaca fiber is biodegradable. Alpacas require no insecticides, herbicides and fertilizers which pollute the groundwater. Maple Hill Manor has welcomed tourists to Central Kentucky for 25 years, providing award-winning B&B accommodations. Guests are invited to relax and experience a scenic, country-setting on the historic, Kentucky Farm, which dates back to 1851. It is located on the Bourbon Trail, just minutes from America’s “Most Beautiful Small Town,” Bardstown, and only an hour’s drive from Lexington or Louisville. Spacious, elegantly antique-appointed Guest Rooms feature a private bath (some with whirlpool baths for two), fireplaces, Turkish Towels, luxurious bed linens, Alpaca blankets, and top-quality mattresses. Maple Hill Manor offers homemade desserts each evening and a Full Country Gourmet Breakfast with fresh fruit and made from scratch entrées (comprised of Kentucky Proud produce), served with fine table linens, candlelight, and china and crystal each morning. Chef Tyler’s gourmet creations have also been featured in the cookbook, Room at the Table, published by the Bed and Breakfast Association of Kentucky. The working farm, includes nearly 50 Alpacas and Llamas, a Fiber Farm Store – featuring luxury fiber products made of Kentucky’s only Purely Suri Breeding Program of both Suri Alpacas and Suri Llamas, as well as a small fruit orchard, berry patch, herb and vegetable garden. Maple Hill Manor has been recognized nationally, voted #1 (2X) as the B&B with the “Most Historical Charm,” “Best B&Bs in the South,” (2X) “Best Breakfast in the Southeast,” “Kentucky’s Best B&Bs” by readers of Kentucky Monthly Magazine, and Top 10 Innkeepers in the U.S. by BedandBreakfast.com. Headquartered in Nashville, TN, the Alpaca Owners & Breeders Association (AOBA) serves to facilitate the expansion of a strong and sustainable alpaca industry through the growth and development of the national herd and its products. Since AOBA’s formation in 1988, its membership has grown steadily to more than 4,000 members with over 160,000 registered alpacas in North America. To find out more about National Alpaca Farm Days, visit www.NationalAlpacaFarmDays.com. 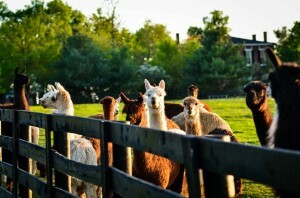 To learn more about Maple Hill Manor, visit www.MapleHillManor.com or call 859.336.3075, alpacas@mapelhillmanor.com.